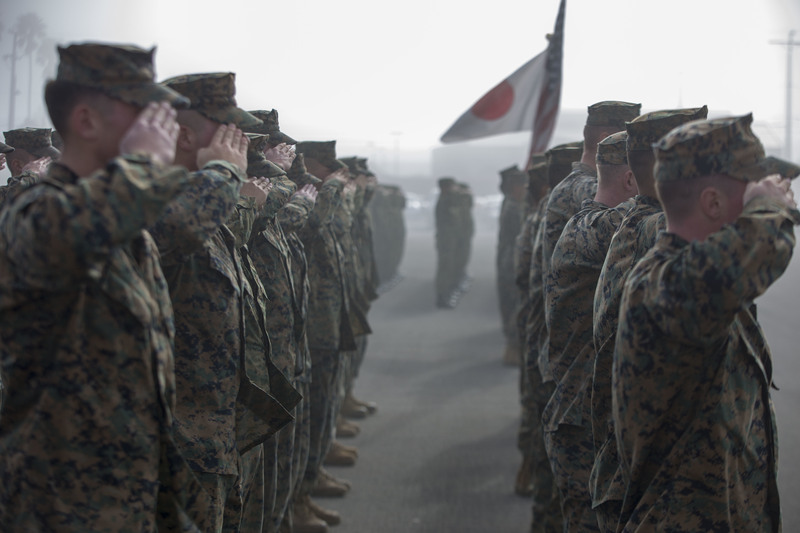 CAMP PENDLETON, Calif. — With its official operational date fast approaching, Japan’s first Amphibious Rapid Deployment Brigade kicked off the bilateral Iron Fist 2018 exercise on Friday with an opening ceremony alongside its Marine Corps hosts. It wasn’t a time for long speeches. 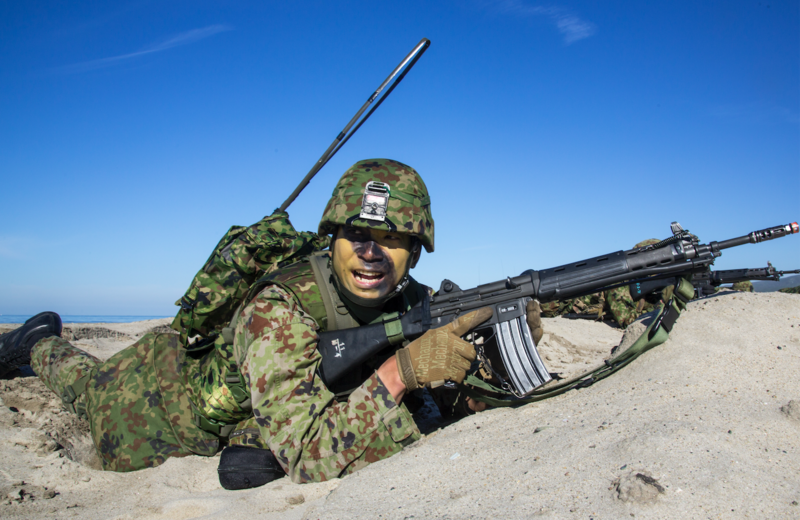 Over the next month, 350 soldiers with the Japan Ground Self Defense Force will train closely with Marines to hone skills that will run the gamut from amphibious reconnaissance and fire-and-maneuver assaults to close-air support and staff planning. They will fire mortars and artillery, land on beaches aboard rubber boats and assault craft and attack and defend “friendly” land from foes in various training scenarios. This year’s Iron Fist exercise – it runs from Jan. 12 to Feb. 12 – marks the 13th iteration of the annual training that focuses on amphibious operations, with I Marine Expeditionary Force as a primary host. With a 2012 decision by Japan to create amphibious rapid deployment brigades, Iron Fist’s training focus has shifted toward building that “go-to” force, as envisioned, to quickly respond when needed to protect Japan’s many islands from threats and harm, whether to its national security or from natural disasters. Officials from both countries tout the continuing, growing relationship and partnership among the various branches of the U.S. military and self-defense force. “We live in a very dangerous and complex world. There are numerous threats aimed at the United States. 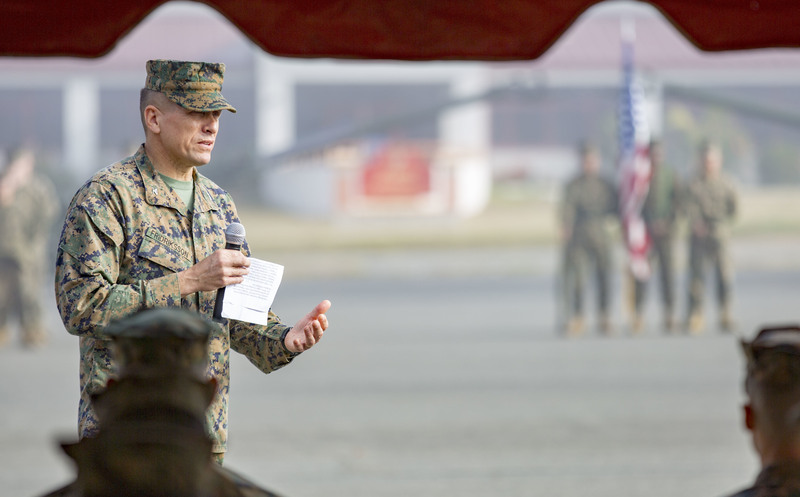 It is truly reassuring to work together,” Col. Fridrik “Fred” Fridriksson, the 11th Marine Expeditionary Unit commander, said in a short speech to the crowd gathered at a Camp Del Mar parade ground. Japan has been working in recent years to build a “joint dynamic defense force,” with the ARDB is a key part of that. It has partnered with the Marine Corps and the Navy, leaning on their long expertise in amphibious, blue-green missions and joint operations at sea to develop comparable tactics, techniques and procedures for the new brigade force. Since the first iteration in 2006, Iron Fist training in recent years has shifted from a larger focus on disaster relief and humanitarian operations to include island defense, or what’s described as “recapturing invaded islands,” according to the key JGSDF missions and ARDB roles, according to its Ministry of Defense website. Col. Ryuji Toyota, who commands the Western Army Infantry Regiment based on the island of Kyushu, spoke just briefly during the ceremony, noting such exercises enable the “step by step” development of the unit’s amphibious capabilities. 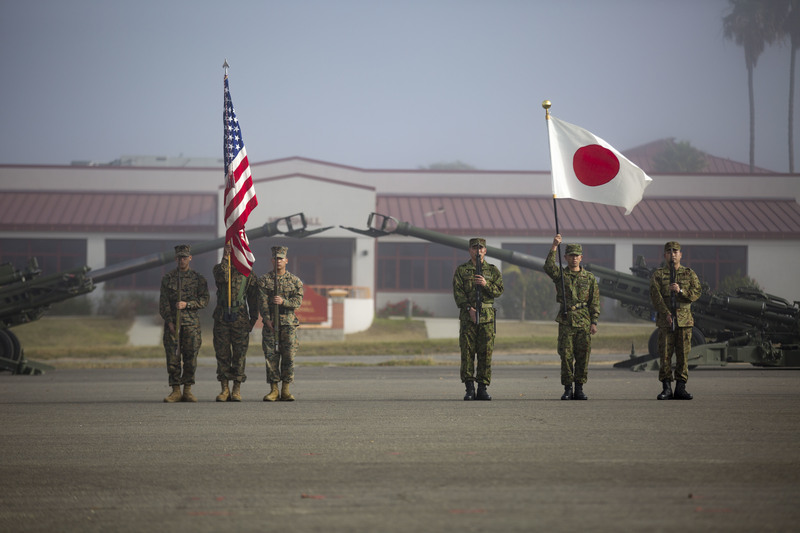 During this year’s Iron Fist, the JGSDF soldiers will conduct training at Camp Pendleton and in the desert at the Marine Corps Air-Ground Combat Center at Twentynine Palms, Calif., as well as on the Navy’s offshore San Clemente Island and aboard USS Rushmore (LSD-47), officials said. “Japan is investing a lot of time and a lot of money and, incredibly, soldiers to this exercise. This is really, really exciting for us,” he added. The vast live-fire and maneuver ranges and assault beaches are highly sought-out by the JGSDF as soldiers are limited in the ranges available to them at home in Japan. Some of the soldiers have trained at the California bases in previous exercises, although more than half are participating in Iron Fist for the first time, according to a Marine liaison to the force told USNI News. “This is the big milestone,” said Maj. Paul S. Smith, a communications officer by training who recently started his assignment as a Marine liaison officer with the Western Army Infantry Regiment. “We want to build up, hopefully, their expertise and capabilities that they have so far,” said Smith, one of three liaisons currently assigned as work with the JGSDF. A few JMSDF officers attended the opening ceremony, but Japan has no ship participating in the exercise. Bolstering that blue-green relationship within Japan’s joint force will be critical, noted a research analyst who closely follows U.S.-Japan defense issues. Having additional maritime officers “plugged in” with the ground forces as well as with the Marine Corps and Navy, he said, are needed for them to build a credible joint amphibious capability. With its April 1 target ahead, the ARDB won’t be near brigade size, in personnel and in equipment. 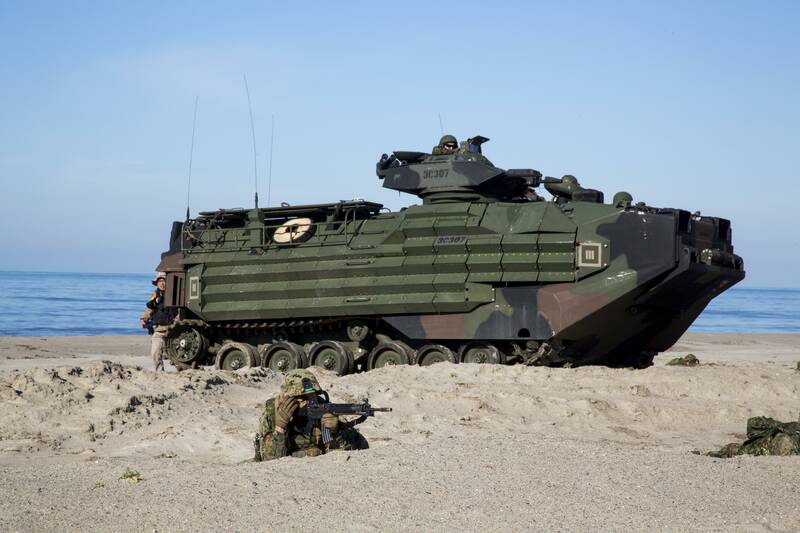 Key to the brigade’s ability to rapidly deploy with amphibious capabilities are the MV-22B Osprey tiltrotor aircraft and the AAV-7, the amphibious assault vehicle used by Marines, both of which Japan is purchasing for the new force. The ARDB currently has four amtracs in hand, Smith told USNI News on Friday. As many as 30 vehicles were planned to be available by the time the first ARDB unit is stood up by April 1. But last month, news agencies in Japan reported that “production delays” in amtracs or parts will delay the fielding of the vehicles by at least several months.